The University of Aberdeen Zoology Museum (UK) has taken care of a case of mounted Australian birds, one of which is the spectacular but sadly extinct Paradise Parrot Psephotus pulcherrimus. Nature-lover Michael Middleton, from the city centre, donated the exotic birds after the case that held them developed woodworm. It prompted him to scan the internet for more information on the assortment of stuffed birds, totalling three parrots, a pardalote, a kookaburra, a wild budgie and a cuckoo-shrike. The specimens have been in Mr Middleton's family for around half a century. So he was stunned when he discovered one of his feathery charges had not been seen since 1927. Realising the slice of Australian heritage he had on his hands, Mr Middleton has donated all the birds to the University of Aberdeen's Zoology Museum. 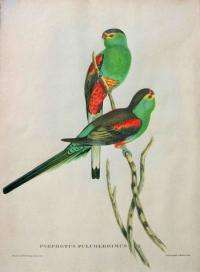 Although 26 species of Australian birds are currently classified as being endangered, the brightly plumed Paradise Parrot is the only mainland species of bird to have become extinct since white settlement. Dr Martyn Gorman, honorary curator of the Zoology Museum, said: "We are indebted to Mr Middleton for his great generosity and delighted that this important specimen can now be seen by the public at large. "To receive a specimen of a recently extinct species is a rather special event. "It is sad that the Paradise Parrot is extinct but we hope that our parrot will help educate people about the need for conservation of wildlife. "One wonders what other zoological treasures there are in people's homes." The Paradise Parrot was locally common in the wild although generally scarce in the 19th century, but then declined rapidly and by 1915 the species seemed to have disappeared. A newspaper campaign led to its rediscovery in 1918 but the bird had by then become very rare and the last confirmed sighting was by a C.H. Jerrerd on the 14th of September 1927 in the upper Burnett River area off the Southern Queensland coast. "No one can see it without desiring to possess so beautiful and graceful a bird, and large sums are constantly being paid for handsome specimens by amateurs; but alas! one in a dozen survives a few months and dies suddenly in a fit." It is thought the decline of the species may have started long before the Europeans invaded Australia. However, the introduction of cattle by the white settlers was to prove a fatal blow. The parrots fed on grass seeds, and livestock undoubtedly reduced this food supply. Many also died as the ranchers deliberately set fire to the plains to stimulate the growth of fresh grass for the cattle. This gave rats' easy access to the eggs and young, which were hidden in burrows on the ground. Man also posed a direct threat through egg collecting.